José Mourinho made several changes in Real Madrid's trip to the Riazor ahead of facing Deportivo de la Coruña, by leaving Cristiano Ronaldo, Mesut Ozil and Sami Khedira on the bench. Despite the fierceful opposition from the home side, the Merengues turned around the game in their favor deep in the second half, as they ended up winning it by 1-2, thanks to goals from Ricardo Kaká and Gonzalo Higuaín. The key moment in the game was when Ronaldo, Ozil and Khedira stepped up to the pitch in a triple substitution, a change that granted Real Madrid a whole different dynamic in the attack. It was another tough away win that Real Madrid earned this Saturday night, in a visit to the Riazor stadium to clash with Deportivo de la Coruña. The final 1-2 result shows well how tight the game was, with Deportivo prevailing as the stronger side on the pitch until the 56th minute of the game and Real Madrid waking up and dictating their rules in the remaining period of the match. The switch in the game was triggered precisely with José Mourinho's tripple substitution roughly 10 minutes after the break, as the Portuguese coach brought in Cristiano Ronaldo, Ozil and Khedira, all at once. The Merengues goals arrived shortly after, with Kaká equalizing in the 73rd minute and Gonzalo Higuaín scoring from an easy tap-in in the 88th minute, after a good assist from Ronaldo. The next opponents are the Blaugrana, and we can all watch Barcelona vs Real Madrid this Tuesday night, as both teams will battle for a presence in the Spanish Copa del Rey final. The hopes of winning the Spanish League title are long gone and Mourinho didn't hesitate in picking a second-tier side to face Deportivo in the Riazor this weekend. Players like Fábio Coentrão, Sergio Ramos, Xabi Alonso, Cristiano Ronaldo, Khedira, Ozil or Benzema, were all given some rest and none of them starred in the starting line-up. José Mourinho is well aware of his club priorities for this season and there was an assumed and implicit risk in his choices ahead of this game. Deportivo started stronger, exposing Real Madrid's weaknesses in a more prominent way than usual. The Merengues lacked the dynamic usually brought in by Cristiano Ronaldo or Mesut Ozil, as both the midfield and the attack didn't seem to be able to connect as they should, in order to create difficulties for Deportivo. The home side gradually increased their presence in the game after the kickoff and following several good chances to get the opener, they managed to reach the lead in the 35th minute, after a powerful left-foot shot by Riki. The 32-years old forward received a pass from the former Atletico Madrid winger, Pizzi, and slammed the ball into the back of the net, making Diego López look bad in the picture. The lead was well deserved and as half-time reached, the Merengues couldn't really complain about the fairness of the result. Mourinho knew he could shake the game in any given moment, as he counted with several key players on the bench, ready to step in whenever the Portuguese coach decided to be the right time. It didn't happen during the break, but Mourinho got fed up after 10 minutes played in the second half and sent in Ronaldo, Ozil and Khedira all at once. The changes had an immediat impact, as Real Madrid started creating more danger near Deportivo's goal and showed a lot more freshness and pace in building up attacking plays. The equaliser arrived in the 73th minute, in a splendid curled strike form Ricardo Kaká. The Brazilian received a pass from Angel di María still outside Deportivo's penalty area, and made the ball curve past Aranzubia, scoring his first goal in La Liga this season. That's right, Kaká now has 3 goals in the 2012-2013 season, but only one of them was scored in the Spanish League. There was still time for the Merengues to go after the winning goal and with Ronaldo on field, opportunities for that to happen kept appearing in a different rhythm than before his entrance. It still took Real roughly 15 more minutes to get it, but what matters is that they found a way to breach into Deportivo's defence once again and finally took the lead in the game. With 88 minutes on the clock, Ricardo Kaká made a superb through pass for Cristiano Ronaldo and the Portuguese used his speed to beat Deportivo's back line and assist Gonzalo Higuaín in the middle, for an easy tap-in goal against an empty net. José Mourinho knew how vital it is to give as much rest as possible to several of his key players before the upcoming games, but he also knew it would be important to keep a winning mentality in such a decisive period of the season. In 3 days from now, the Merengues will virtually play their first final in the Barcelona vs Real Madrid clash at the Camp Nou and a good result there would most likely inspire José Mourinho's men for the Old Trafford encounter on March 5. 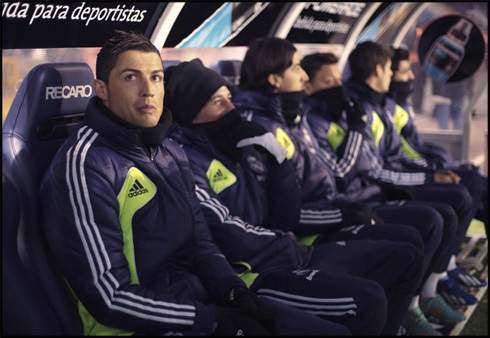 Cristiano Ronaldo next game for Real Madrid will be against Barcelona, on February 26, 2013, for the Copa del Rey second leg. You can watch Juventus live stream, Barcelona vs Real Madrid, Inter Milan vs Milan, Manchester City vs Chelsea and Bradford vs Swansea, all matches provided from our soccer live section.